Book the day before if you can, then ride the 5-person capsule to the top. Claustrophobic? Slightly. At the summit, you’ll feel every bit of 630 feet high peering out the tiny windows. Pros: Bragging rights. Only takes 60 minutes if you book the day before. Cons: Sadly uninformative. Watch the PBS documentary before you go. They charge $7 for the educational movie. Minimal exhibits. Free museum below the arch is the worst I’ve ever seen. No same-day booking for tours to the top. 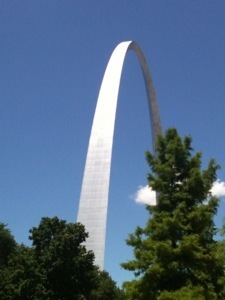 This entry was posted in architecture, science, travel, travel with kids and tagged elevators, famous arches, St. Louis architecture, Travel, travel with boys by Christel Walke. Bookmark the permalink.